Like Syriac, and probably under its influence, Hebrew has been handed down with a twofold pronunciation, the Ashkenazic and the Sephardic. The former is usually traced to Babylonia, the latter to Palestine. There are at present no sufficient data for a decision as to the tenability of this theory. On the one hand it is known that the Sephardim (i.e., the Spanish-Portuguese Jews) came to Europe from Palestine, while the Ashkenazim (i.e., the German-Slavonic Jews) came, at least in part, through southern Russia from Babylonia and Mesopotamia. It is known also that the vowel "ḳameẓ" was pronounced in Palestine from the time of the Septuagint down to Jerome as the a in the English word "father." This would tend to support the theory of a Palestinian origin for the Sephardic pronunciation. But against it are the following considerations: The analogy of the Syriac would indicate that the "ḳaṃeẓ" was pronounced ā in Babylonia and ô in Palestine. There is no proof that the Babylonians in early times pronounced the "ḳameẓ" like ô. The o sound of that vowel was known even to Philo of Alexandria (Siegfried, in "Merx's Archiv," vol. i. ), and, according to Abraham ibn Ezra ("Ẓaḥot," p. 3b), was the prevalent one in Tiberias and North Africa in later times. Two of the systems of vocalization which have been handed down had, according to tradition, their origin in Palestine, and agree with the traditional Babylonian system of vocalization in representing "ḳameẓ" as o. 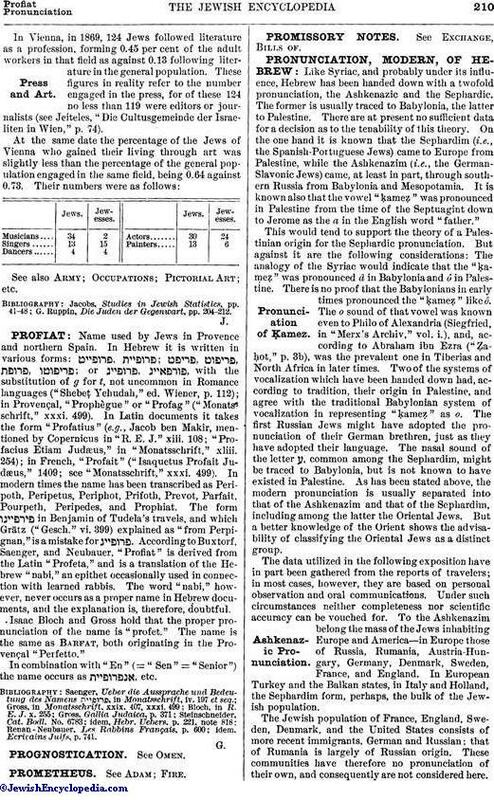 The first Russian Jews might have adopted the pronunciation of their German brethren, just as they have adopted their language. The nasal sound of the letter ע common among the Sephardim, might be traced to Babylonia, but is not known to have existed in Palestine. As has been stated above, the modern pronunciation is usually separated into that of the Ashkenazim and that of the Sephardim, including among the latter the Oriental Jews. But a better knowledge of the Orient shows the advisability of classifying the Oriental Jews as a distinct group. The data utilized in the following exposition have in part been gathered from the reports of travelers; in most cases, however, they are based on personal observation and oral communications. Under such circumstances neither completeness nor scientific accuracy can be vouched for. To the Ashkenazim belong the mass of the Jews inhabiting Europe and America—in Europe those of Russia, Rumania, Austria-Hungary, Germany, Denmark, Sweden, France, and England. In European Turkey and the Balkan states, in Italy and Holland, the Sephardim form, perhaps, the bulk of the Jewish population. The Jewish population of France, England, Sweden, Denmark, and the United States consists of more recent immigrants, German and Russian; that of Rumania is largely of Russian origin. These communities have therefore no pronunciation of their own, and consequently are not considered here.For the same reason the Jews in the German territory of Austria, and in Hungary, are left out of consideration. The chief countries having characteristic pronunciation are Russia, Germany, and Slavonic Austria. Throughout the Ashkenazic group the following sounds are identical: (b); (g); (d); ה(h); ו (z); ת (German ch in "ach"); י (y); (k); ל (l); מ (m); נ (n); ס (s); (p); פ (f); צ (ts); ק (k); (s). The letters א and ע are not pronounced except when standing between two vowels, in which case they form a hiatus. The quantity of the vowels is not observed; ă, ĭ, and ī have the Italian sounds of a and i. Post-vocalic א and ע, when in the tone-syllable, are frequently pronounced like י (comp. Levias, "Aramaic Grammar," p. 9, note 6). All words, except and ("Lord" and "God"), are accented on the penult. All post-tonic vowels are reduced to the indefinite sound è. The vocal "shewa," at the beginning as well as in the middle of a word, is usually disregarded. The "ḥaṭefs" are frequently treated as full vowels. All such characteristics are common in private reading of Hebrew and in pronouncing the Hebrew vocables which have entered the vernacular. In the public reading of the Bible in the synagogues, however, every vowel is given a distinct sound, and the Masoretic accent is observed; all this with a degree of correctness dependent upon the knowledge of the individual reader. Notice the pronunciation of . The Jews of the Russian empire may be broadly divided into two groups—those of Lithuania and those of the former kingdom of Poland. The difference in the pronunciation of the two groups is mostly in the vowel-sounds. 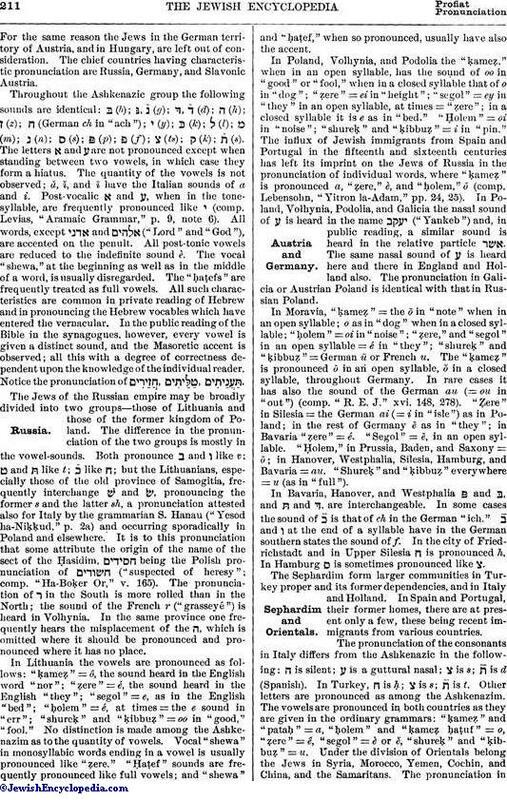 Both pronounce ב and ו like v; ט and like t; like ת; but the Lithuanians, especially those of the old province of Samogitia, frequently interchange and , pronouncing the former s and the latter sh, a pronunciation attested also for Italy by the grammarian S. Hanau ("Yesod ha-Niḳḳud," p. 2a) and occurring sporadically in Poland and elsewhere. It is to this pronunciation that some attribute the origin of the name of the sect of the Ḥasidim, being the Polish pronunciation of ("suspected of heresy"; comp. "Ha-Boḳer Or," v. 165). The pronunciation of ר in the South is more rolled than in the North; the sound of the French r ("grasseyé") is heard in Volhynia. In the same province one frequently hears the misplacement of the ה, which is omitted where it should be pronounced and pronounced where it has no place. In Lithuania the vowels are pronounced as follows: "ḳameẓ" = ô, the sound heard in the English word "nor"; "ẓere," = é, the sound heard in the English "they"; "segol" = e, as in the English "bed"; "ḥolem" = é, at times = the e sound in "err"; "shureḳ" and "ḳibbuẓ" = oo in "good," "fool." No distinction is made among the Ashkenazim as to the quantity of vowels. Vocal "shewa" in monosyllabic words ending in a vowel is usually pronounced like "ẓere." "Ḥaṭef" sounds are frequently pronounced like full vowels; and "shewa" and "Ḥaṭef" when so pronounced, usually have also the accent. In Poland, Volhynia, and Podolia the "ḳameẓ," when in an open syllable, has the sound of oo in "good" or "fool," when in a closed syllable that of o in "dog"; "ẓere" = ei in "height"; "segol" = ey in "they" in an open syllable, at times = "ẓere"; in a closed syllable it is e as in "bed." "Ḥolem" = oi in "noise"; "shureḳ" and "ḳibbuẓ" = i in "pin." The influx of Jewish immigrants from Spain and Portugal in the fifteenth and sixteenth centuries has left its imprint on the Jews of Russia in the pronunciation of individual words, where "ḳameẓ" is pronounced a, "ẓere," è, and "ḥolem," ô (comp. Lebensohn, "Yitron la-Adam," pp. 24, 25). In Poland, Volhynia, Podolia, and Galicia the nasal sound of ע is heard in the name ("Yankeb") and, in public reading, a similar sound is heard in the relative particle . The same nasal sound of ע is heard here and there in England and Holland also. The pronunciation in Galicia or Austrian Poland is identical with that in Russian Poland. In Moravia, "ḳameẓ" = the ō in "note" when in an open syllable; o as in "dog" when in a closed syllable; "ḥolem" = oi in "noise"; "ẓere," and "segol" in an open syllable = é in "they"; "shureḳ" and "ḳibbuẓ"= German ü or French u. The "ḳameẓ" is pronounced ō in an open syllable, ŏ; in a closed syllable, throughout Germany. In rare cases it has also the sound of the German au (= ou in "out") (comp. "R. E. J." xvi. 148, 278). "Ẓere" in Silesia = the German ai (= i in "isle") as in Poland; in the rest of Germany ē as in "they"; in Bavaria "Ẓere" = é "Segol" = ē, in an open syllable. "Ḥolem," in Prussia, Baden, and Saxony = ō; in Hanover, Westphalia, Silesia, Hamburg, and Bavaria = au. "Shureḳ" and "ḳibbuẓ" everywhere = u (as in "full"). In Bavaria, Hanover, and Westphalia and , and and , are interchangeable. In some cases the sound of is that of ch in the German "ich." and ו at the end of a syllable have in the German southern states the sound of f. In the city of Friedrichstadt and in Upper Silesia ת is pronounced h. In Hamburg ם is sometimes pronounced like צ. The Sephardim form larger communities in Turkey proper and its former dependencies, and in Italy and Holland. In Spain and Portugal, their former homes, there are at present only a few, these being recent immigrants from various countries. The pronunciation of the consonants in Italy differs from the Ashkenazic in the following: ת is silent; ע is a guttural nasal; צ is s; is d (Spanish). In Turkey, ת is ḥ; צ is s; is t. Other letters are pronounced as among the Ashkenazim. The vowels are pronounced in both countries as they are given in the ordinary grammars: "ḳameẓ" and "pataḥ" = a, "ḥolem" and "ḳameẓ ḥaṭuf" = o, "Ẓere" = ê, "segol" = è or ĕ "shureḳ" and "ḳibbuẓ" = u. Under the division of Orientals belong the Jews in Syria, Morocco, Yemen, Cochin, and China, and the Samaritans. The pronunciation inSyria shows the following differences: are both pronounced like j in "jet," or g in "strange"; ו is the English w; ת is ḥ; ט is ṭ; בּ is the English ch in "check," "rich"; ע has the sound of the Arabic letter "'ain"; צ = the English s in "hiss"; ק is pronounced like as th in "thin." All the vowels are pronounced as in Italy. In Morocco the letters , are pronounced as their equivalent Arabic sounds, ', gh, dh, w, ḥ, ṭ, kh, ', ṣ, ḳ. According to some, צ is the English ch in "check," "rich"; ת = ts. According to other reports, has also the sound of ch in "check." The vowels "ḥolem" and "shureḳ" = "ḳibbuẓ" are almost indistinguishable; so with "Ẓere" and "ḥireḳ" "Pataḥ" and "segol" are frequently interchanged. The a vowel of the article is omitted. Vocal "shewa" before the gutturals is sounded like the following vowel: "shewa" with "ga'ya" = ă. In Yemen, have the sounds of the corresponding Arabic letters, as given above. 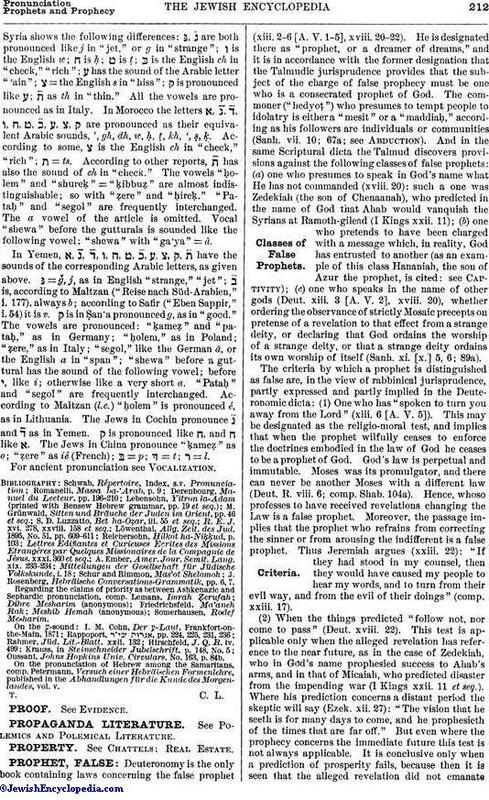 נּ = ğ, j, as in English "strange," "jet"; is, according to Maltzan ("Reise nach Süd-Arabien," i. 177), always b; according to Safir ("Eben Sappir," i. 54) it is v. ק is in Ṣan'a pronounced g, as in "good." The vowels are pronounced; "ḳameẓ" and "pataḥ," as in Germany; "ḥolem," as in Poland; "Ẓere," as in Italy; "segol," like the German ā, or the English a in "span"; "shewa" before a guttural has the sound of the following vowel; before י like i; otherwise like a very short a. "Pataḥ" and "segol" are frequently interchanged. According to Maltzan (l.c.) "ḥolem" is pronounced é, as in Lithuania. The Jews in Cochin pronounce and as in Yemen. ק is pronounced like ת, and ת like א. The Jews in China pronounce "ḳameẓ" as o; "Ẓere" as ié (French); בּ = p; דּ = t; ר = l.
For ancient pronunciation see Vocalization. J. Rosenberg, Hebräische Conversations-Grammatik, pp. 6, 7. Oussani, Johns Hopkins Univ. Circulars, No. 163, p. 84b. On the pronunciation of Hebrew among the Samaritans, comp. Petermann, Versuch elner Hebräischen Formenlchre, published in the Abhandlungen für die Kunde des Morgenlandes, vol. v.